Around the World...Around the Wuurld...Around the World... Around the Wuuuuuurrrrrlllllllld! Riverstone Stables is superbly located in the quiet surrounding countryside of Kagaroo Valley, just 2 hours drive from Sydney and Canberra and 25 minutes from the Nowra bridge and lovely village of Kangaroo Valley with its shops and restaurants. Trail rides at Riverstone Stables use the old logging tracks and you wend your way through beautiful tree lined pathways, splash gently through rivers running down the gullys and smell the fresh rain forests whilst listening to the music of the native birds and animals surrounding you all whilst you are at one with your horse. The Riverstone property is located within both the Morton and Budgong National Parks. There are ample opportunities to take in the breathtaking panoramic views from lookouts which would otherwise not be accessible or perhaps discovered. Riverstone Stables staff are really professional and friendly and the horses are in excellent condition and extremely well trained. 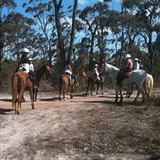 Adults and children often ride together and enjoy amiable hacks through the lovely forests. Take a picnic with you and tie up your horse beside fresh water lakes. You are even able to swim with the horses (on the horses) in the lake, that's a tremendously rare opportunity and a once in a lifetime experience. You may even see kangaroos and be lucky enough to hear Lyre birds calling. It's a really great stable and definitely worth the trip out of Sydney. Stay overnight at Lyrebird Organic Winery just 5 minutes drive along the track. An absolutely superb weekend away.